Figure 1.3. Axial CT scans of three vertebrae. (A) Scan of a T11 vertebra demonstrates the sagittal configuration (straight posterior to anterior) of the pedicle with respect to the vertebral body. The line demonstrates the general tract that a needle would take during vertebroplasty by means of a transpedic-ular approach. In the scan of an L5 vertebra (B), the transpedicular approach (black line) is nearly 45° away from the sagittal plane. 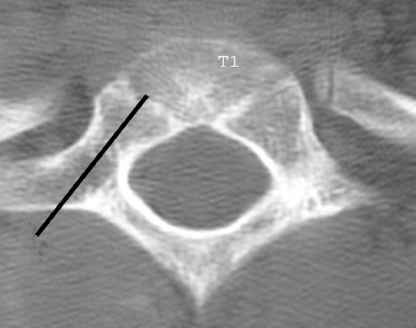 In the scan at T1 (C), the transpedicular angle with the sagittal plane (black line) approaches 45°, simiar to the angle found in the lowest lumbar vertebra. the pedicles relative to the vertebral body changes as does their size. From T4 to T12 the pedicles have a relatively straight sagittal (anterior-to-posterior) orientation (Figure 1.3A). In the lumbar spine from L1 to L4 there is a slow but progressive angle away from the sagittal orientation. At L5 the angle is extreme and can approach 45° away from the sagittal plane (Figure 1.3B). Progressive angulation also occurs from T4 toward the cervical region (Figure 1.3C). Therefore, both pedicle size and angulation are important when one is planning a transpedicular approach during intervention. Though the size of the pedicles varies from region to region and from individual to individual, one can be comfortable that a 13-gauge cannula (0.095 in., outside diameter) will fit through essentially all adult pedicles from T4 to L5. In most individuals a 10- to 11-gauge cannula (0.134-0.120 in., outside diameter) will safely pass through pedicles from T12 to L5. Figure 1.4. The parapedicular approach. 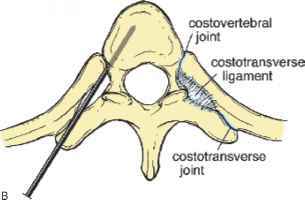 (A) In this lateral view, notice that the needle enters above the transverse process. 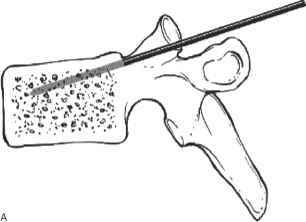 (B) Needle placement position for a parapedicular approach in vertebroplasty. space is filled with fatty tissue and venous structures. Venous bleeding is common here, but this is usually self-limiting as long as no co-agulopathy exists. Occasionally, the posterior costophrenic sulcus contains lung that bulges beyond the border of the rib, making pneumothorax also possible. The bones of the vertebra make up part of the central skeleton, inside of which the elements of the blood are made. This occurs in the intertrabecular (marrow) space. The venous system connects to this marrow space (Figure 1.5). This connection provides one of the main avenues for cement leakage during vertebroplasty or kyphoplasty. The venous route most important for potential leakage is through the posterior vertebral wall, communicating with the veins in the epidural space. Leakage into this location can create compression of the cord or nerve roots. Venous leak anterior or laterally can result in cement migration into central veins carrying blood to the lungs (resulting in pulmonary emboli). Figure 1.5. (A) The venous communications typical in a vertebra: AEVP, anterior external venous plexus; IVV, intervertebral vein; ARV, anterior radicular vein; PRV, posterior radicular vein; PIVP, posterior internal venous plexus; PEVP, posterior external venous plexus; BVV, basivertebral vein. 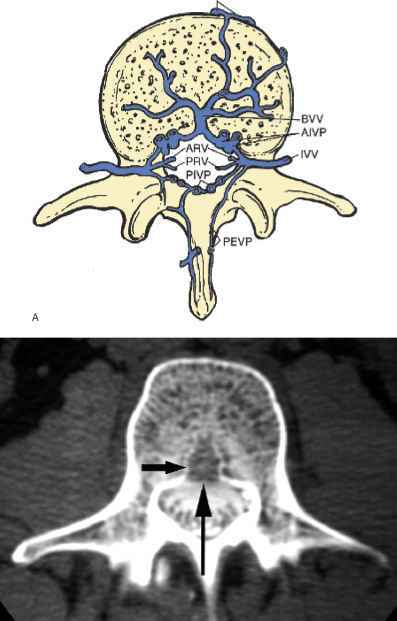 (B) Axial CT scan demonstrating the posterior wall opening (black arrows) that allows the major veins of the interior of the vertebra (BVV, basivertebral vein) to communicate with epidural veins. The intervertebral discs and joints interface with the various vertebrae in the spine. Together with the ligamentous attachments, these elements allow the vertebrae to move through bending and rotation. However, these discs and joints wear and may be the source of pain caused by degeneration. The image-guided interventionist must deal with these structures during discography, percutaneous discectomy, intradiscal electrothermal therapy, facet blocks, and dorsal ramus neurolysis. The intervertebral discs are composed of an outer ring of fibrocarti-lage called the annulus fibrosis (Figure 1.6A,B). 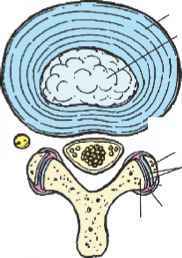 The annulus is attached to the cartilaginous endplates of the vertebrae and constrains the inner disc core called the nucleus pulposus. The annulus is thickest anteriorly. It is thin posteriorly, which coincides with the area most commonly associated with annular tears and disc herniations. The outer annular fibers, which are more densely packed, are referred to as Sharpey's fibers. The nucleus pulposus is made of cells that are notochordal remnants. It is composed of collagen fibrils that are embedded in a proteoglycan matrix that contains water. With aging and degeneration, water is lost and the nucleus becomes progressively fibrotic and smaller. Because of the spine curvature (Figure 1.1), the angle of the plane of the disc between the vertebral endplates is variable through the spine. This variation requires different imaging angulation to enter the disc without obstruction by the adjacent vertebral margins. Appropriate imaging angulation is necessary for accurate needle placement in discog-raphy and percutaneous disc therapy. 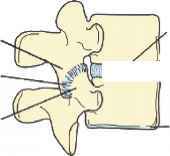 The apophyseal or facet joints are paired joints between the posterior elements of two adjacent vertebrae. 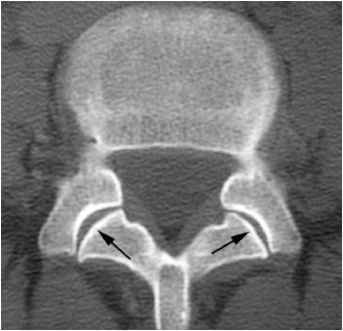 They are curved joints that are oriented obliquely to the sagittal plane (Figure 1.6C). The joints are asymmetric in about 30% of the population.9 Each joint consists of an articular process from each of the adjacent vertebra. The joint has a synovial lining with a fibrous capsule (Figure 1.6A,B). The nerve supply is from the medial division of the dorsal ramus of the spinal nerve that reaches the joint from the nerve above and below the joint on the ipsilateral side (Figure 1.7A). The joint is believed to be a source of non-radiating axial pain that is typically aggravated by hyperextension and rest. Because the joint is curved, image guidance can be confusing and entry into the joint may be difficult, particularly when there is degenerative disease. A small synovial recess along the superior and inferior margins of the joint will allow access without passing through the curved bone margins. Facet blocks are used for diagnostic confirmation of the pain source. 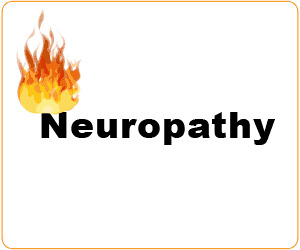 As they rarely have prolonged therapeutic benefit, neurolysis of the joint nerve supply with chemical or radiofre-quency (RF) ablation is most often used for long-term pain control. Figure 1.6. The intervertebral disc. (A) Lateral drawing depicting the disc components and their association with the adjacent hyaline cartilaginous endplates. (B) Axial drawing demonstrating that the annulus fibrosus is thickest anteriorly. The capsule and lining of the facet joint also are shown. 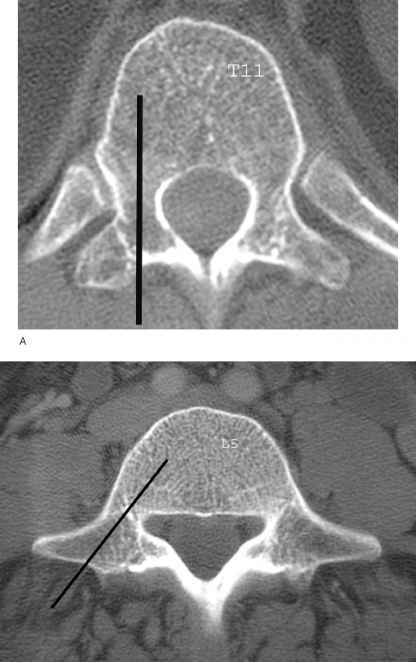 (C) Axial CT scan showing the complex configuration of the facet joints (black arrows). Figure 1.7. (A) Axial drawing of the nerve exiting the neural foramina of a lumbar vertebra and giving off the posterior ramus. A medial branch of this nerve will supply the capsule of the facet joint. These innervations arise from medial branches from both above and below each joint. The gray and white rami communicantes connect the autonomic ganglia with the anterior division of the spinal nerves. (B) Axial MR scan showing the neural foramina (white arrows) of a lumbar vertebra containing the dorsal root ganglia (white arrowhead). Figure 1.7. Continued. (C) Axial drawing of a cervical vertebra. This highlights the close proximity of the vertebral artery with the exiting spinal nerve. (D) Axial MR scan of a cervical vertebra demonstrating the vertebral artery (black arrow) along the anterior neural foramina. IJ, internal jugular vein; CA, carotid artery; VA, vertebral artery. Entire books have been written about the anatomy of the spinal nerves. For the purpose of this text, we emphasize the elements that are of prime importance to the interventionist. In the spine, as in the brain, there are central (spinal cord) and peripheral components (peripheral nerves) of the nervous system. 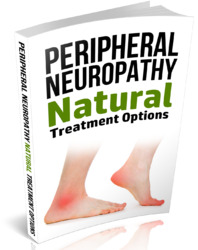 The peripheral nerves are the components that are of major importance from the standpoint of potential therapy. The peripheral nerves are re sponsible for somatosensory, somatomotor, and autonomic nerve function. The spinal nerves exiting the neural foramina are composed of an anterior and a posterior division that coalesce into a single nerve in the neural foramina (Figure 1.7A). The anterior division of the spinal nerve contains the motor fibers that originate in the cell bodies in the anterior horn of the spinal cord. Preganglionic autonomic fibers course in this anterior division as well and originate in the anterolateral horn of the spinal cord. These fibers branch to become the white rami communicantes and synapse with postganglionic autonomic fibers in the autonomic ganglia along the spine to form the sympathetic trunk or extend to ganglia adjacent to end organs (celiac, mesenteric, etc.) via the splanchnic nerves. The sensory neurons (primary afferent) are found in the dorsal root of the spinal nerve. 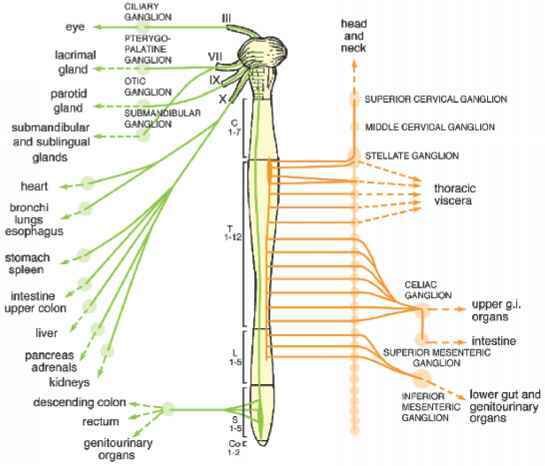 The dorsal root ganglia contain sensory cell bodies; the axons of these sensory nerves originate in specialized sensory structures (Golgi tendon organs, Ruffini endings from the joints, muscle spindles, pacinian corpuscles in fascial planes, etc.) and carry somatic sensory information about touch, propriocep-tion, stereognosis, pain, and temperature. Visceral afferent information is also returned through the dorsal horn. The sensory nerves separate within the cord and take characteristic routes to the brain, where they reach varying levels of consciousness based on their type. The various types of peripheral nerve are different not only because of their relative function but also because of physical size and conduction velocity. The motor fibers are the largest and have the fastest conduction velocity. General sensory fibers mediating touch and pro-prioception are intermediate in size, while pain and nocioceptive fibers are the smallest and have the slowest conduction velocity. To block these fibers an anesthetic must bind to (and block) three consecutive sodium channels (nodes of Ranvier). This means in clinical practice that a smaller amount of anesthetic is needed to block smaller fibers (pain) and that regular sensory and motor fibers are more resistant to anesthetic block. This provides us with the ability to obtain differential blocking that allows pain to be blocked without the loss of motor function (if appropriate amounts of anesthetic are chosen). Selective nerve root blocks are used for diagnostic and therapeutic purposes. The injectate (chosen for a specific effect) is introduced into or just lateral to the neural foramina. This places the injected agent around or peripheral to the dorsal root ganglion. In the lumbar region, the foramina are larger than in the thoracic and cervical spine. Venous vascular structures are common in the lumbar foramina, but a much lower chance of an arterial injection exists here (Figure 1.7A,B). 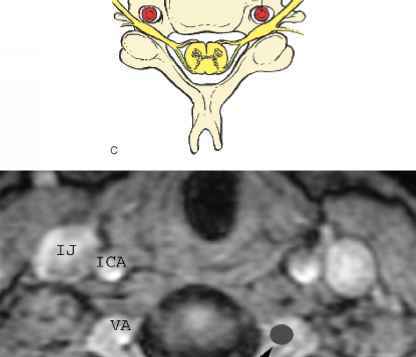 In the cervical region, the vertebral artery lies along the anterior border of the foramina (Figure 1.7C,D). Great care must be exercised when one is doing nerve blocks in this region, since direct injury (dissection) to the vertebral artery can occur and injection of anesthetics or steroids into the artery can create seizure or stroke, respectively. Figure 1.8. Artist's conception of the autonomic nervous system, with its sympathetic and parasympathetic components. Note that these elements have very different origins within the central nervous system. Most organs receive innervations from both parts of the autonomic system. Though sympathetics do not exist in the brain, they reach the organs of the head and neck through ganglia located in the cervical region with preganglionic fibers arriving via the sympathetic track and coursing into and through the inferior (stellate), middle, and superior cervical ganglia. Postganglionic fibers are distributed along blood vessels to the various end organs. Nerves to thoracic, abdominal, and pelvic viscera arrive from the sympathetic chain (traveling along the lateral vertebral bodies) or splanchnic nerves to the ganglia adjacent to end organs such as the heart or pancreas. Once again, blockade of selected ganglia can reduce visceral pain or hyperactivity of the sympathetic system. The anatomical spaces around the spine that are of primary interest to the image-guided interventionist are those found around the thecal sac (epidural space) and the outlet space for the exiting nerve roots (foram-inal space). 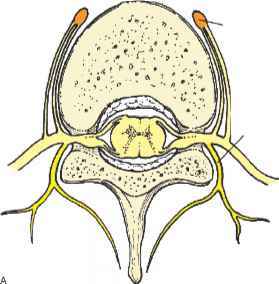 The epidural space begins immediately inside the bony spinal canal and extends from the foramen magnum to the caudal hiatus of the sacrum (Figure 1.7A,C). It surrounds the thecal sac and the exiting nerve roots pass through it into the neural foramina. It is filled with fibrofatty areolar tissue and vascular elements, mostly venous. The arterial supply that traverses the epidural space is basically limited to spinal arteries that enter along spinal nerves to supply the cord, nerve roots, and the parts of the vertebrae adjacent to and circumscribing the epidural space. The epidural space varies in size. It is smallest in the cervical region (1-2 mm) and enlarges progressively toward the lower lumbar and sacral area. At L2-3 the space is 5 to 6 mm wide. If the neck is flexed, the cervical epidural space can increase to 3 to 4 mm.13,14 The epidural space is easily accessed in the sacral and lumbar regions via needle placement through the intralaminar, transforaminal, and caudal (caudal hiatus) routes. Access is via the intralaminar and trans-foraminal routes for the thoracic and cervical epidural space. The epidural space can be septated naturally. Postoperative scarring, which can locally obliterate the space, commonly occurs along the posterior and lateral borders of the thecal sac in the site of the operative field. When this occurs, the intralaminar approach is of reduced utility, and puts puncture of the thecal sac at higher risk. Transforaminal epidural access then becomes the most dependable method. The neural foramina of the spine exist bilaterally from the cervical through the sacral regions. 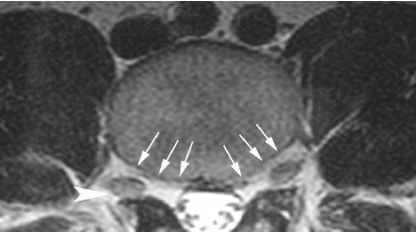 In the sacral region, the foramina are bounded by sacral bone on all sides with exit points both dorsally and ventrally. From the cervical through the lumbar spine, each foramen is bounded by a vertebral body and disc anteriorly, the pedicle superiorly and inferiorly, and facet articular processes posteriorly. The nerve root passes through foramina accompanied by small branches of the spinal artery and veins and surrounded by fatty tissue. The veins communicate with the epidural venous plexus. In the cervical spine, the vertebral artery runs immediately anterior to the exiting nerve root in the foramen transversarium (Figure 1.7C,D). This close association of the nerve and artery can put the artery at risk during transforami-nal approaches for epidural injections and nerve blocks. Direct injury can result in dissection or occlusion. Anesthetic or steroid injection into the artery may cause seizure or stroke, respectively. 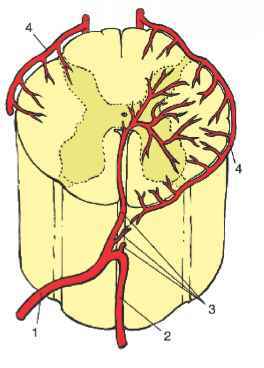 Conceptually, the arterial supply to the cord can be described from the "outside in" as a segmental supply based on the embryological development of the body. In the first few weeks of development in the embryo, the embryo is divided into 31 somites in a rostral-caudal direction. These 31 somites correspond to the 31 pairs of spinal nerves (8 cervical, 12 thoracic, 5 lumbar, 5 sacral, 1 coccygeal). The segmental artery, through its branches, supplies blood to all the ipsilateral derivatives of its corresponding metamer (neural crest, neural tube, and somites), that is, muscle, skin, bone, spinal nerve, and spinal cord. Each segmental/metameric artery is named for the nerve it accompanies in the neural foramen. In the beginning of embryolog-ical development, each segmental artery has a branch supplying the cord, but most regress over time and only a few are left to provide flow to the spinal cord. The remainder will remain unimetameric, supplying the related nerve, dura, vertebral body, and paraspinous muscles. At the end of embryological development, of the 62 metameric arteries (31 pairs), 4 to 8 will supply the ventral spinal axis (anterior spinal artery), and 10 to 20 the dorsolateral/pial network (posterior spinal arteries). The process of regression of cord supply is more pronounced caudally, which results in fewer sources of medullary supply, such as the dominant artery of Adamkiewicz. The simplified algorithm for the vascular supply at each segmental level is: major arterial trunk ^ spinal/segmental artery (31 pairs) ^ radicular artery OR radiculo-pial, or radiculomedullary artery ^ paired posterior or single anterior spinal artery (Figure 1.9). Figure 1.9. Illustration depicting (1) a segmental artery, (2) the somatic branches (vertebral body supply), (3) an intercostal artery or muscular branch, (4) the dorsospinal trunk, (5) paravertebral longitudinal anastomosis, (6) a radiculomedullary artery, (7) the dorsal somatic branch, (8) nerve, (9) the dura, (10) the radicular branches to the dorsal nerve root, (11) the radicular branches to the ventral nerve root, (12) the ventral spinal axis (ASA), (13) a radiculop-ial artery (dorsal radiculomedullary), (14) the dorsolateral spinal network (the posterior spinal arteries). 1. Ventrolateral. An example is the ascending cervical artery (from the thyrocervical trunk) in the neck. 2. Pretransverse (anterior to transverse processes). An example is the vertebral artery in the cervical region, or lateral-sacral arteries. 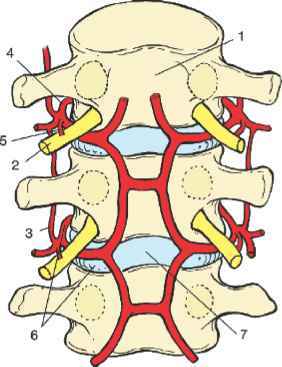 These supply the sympathetic system in the thoraco-lumbar area (Figure 1.10). 3. Dorsal-longitudinal. These anastomoses branch to the midline insertion of the spinous process muscles. The deep cervical artery from the costocervical trunk is an example. Figure 1.10. Selective intercostal artery injection showing longitudinal pre-transverse anastomosis between segmental arteries (open arrow). 1. Cervical. Vertebral arteries, ascending cervical branch of the thyrocervical trunk, deep cervical branch of the costocervical trunk, occipital branch of the external carotid artery (ECA), and ascending pharyngeal branch of ECA. 2. Thoracic. Branches of the costocervical trunk, internal thoracic branch of the subclavian artery, supreme intercostal branch of the aorta, and intercostal branches of the aorta. 3. Lumbosacral. Lumbar branches of the aorta, middle sacral branch of the aorta, lateral sacral branches of the internal iliac arteries, and il-iolumbar branch of the common iliac arteries. At each of the 31 levels, each segmental artery supplies blood to the dorsal and ventral nerve roots, thereby being given the designation "radicular" artery. At some levels, the segmental artery supplies blood not just to the nerve root but also beyond, to the spinal cord, via branches connecting either to the pial/coronal arterial network, or directly to the anterior spinal artery. In the former condition these segmental arteries are named "radiculopial," and in the latter "radiculomedullary." At the level of the surface of the spinal cord there is a single anterior spinal artery (ventral spinal axis) and paired posterior spinal arteries. Connecting these two networks is the pial/coronal (centripetal) network of small arteries. Some experts consider the paired posterior spinal arteries to be part of the pial/coronal network, representing more dominant craniocau-dally oriented channels. According to this definition, those segmental arteries providing supply to the posterior spinal arteries are more ac curately designated as radiculopial rather than radiculomedullary. We will use this definition for this chapter. The flow in the spinal arteries, anterior and posterior, is bidirectional, depending on the dominant medullary artery at each level, as well as the time needed for the aortic systolic pulse wave to reach each radicu-lomedullary or radiculopial artery (more distal arteries will experience the aortic systolic pulse wave later, which also contributes to bidirectional flow). At each of the 31 levels, the spinal/segmental artery provides branches to the dorsal and ventral nerve roots, after giving off branches to the paraspinous musculature, vertebral body, and dura. The only exception is the C1 level, where there may be congenital absence of the radicular branches. 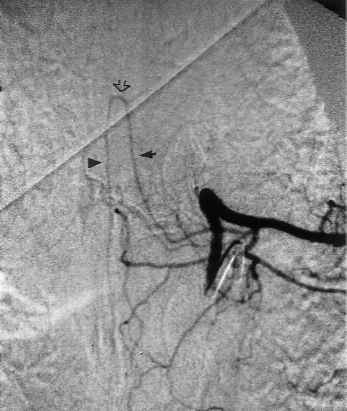 Under normal physiological circumstances, the radicular branches are usually too small to be seen angiographically. The radiculopial arteries supply the nerve roots (via radicular branches), then run ventral to either the dorsal or the ventral nerve root to supply blood to the pial/centripetal (vasa corona) network. These arteries do not supply the anterior spinal artery (ventral axis) directly. They do have anastomoses with pial branches of the anterior spinal artery, however. There are more dorsal than ventral radiculop-ial arteries. The dorsal radiculopial arteries (called dorsal radicu-lomedullary arteries by some authors) are more important, and are the ones referred to as the radiculopial arteries henceforth in this chapter. Their number varies from individual to individual. On average, there are 3 to 4 dorsal radiculopial arteries in the cervical region, 6 to 9 in the thoracic region, and 0 to 3 in the lumbosacral region. The radiculomedullary arteries provide the only segmental supply to the ventral spinal axis (anterior spinal artery) and are the dominant source of supply to the cord over several functional segments. Sources: Modified from Lasjaunias, P, Berenstein, A, TerBrugge KG. Surgical Neuroan-giography. 2nd ed. 2001. With permission from Springer-Verlag New York. After giving off their radicular branches to the nerve roots, they run along the ventral surface of the nerve root, occasionally giving off a pial collateral, then supply the anterior spinal artery. Their number varies from individual to individual. On average, there are 2 to 4 (ventral) radiculomedullary arteries in the cervical region, 2 to 3 in the thoracic region, and 0 to 4 in the lumbosacral region. Classically, two radiculomedullary arteries have received special attention: the arteries of the cervical and lumbar enlargements. The artery of the lumbar enlargement is also known as the artery of Adamkiewicz (Table 1.2). In 75% of patients, the artery of Adamkiewicz arises between T9 and T12, more commonly on the left. When its origin is above T8 or below L2, there is another major contributor to the anterior spinal artery either caudally or cranially. In 30 to 50% of cases, it also gives a major contribution to dorsolateral pial system (paired posterior spinal arteries) (Figure 1.11). Figure 1.11. Selective injection of an intercostal branch supplying the ventral spinal axis showing the artery of Adamkiewicz [artery of the thoracolumbar enlargement (small arrow)] and the ventral spinal axis [anterior spinal artery (arrowhead)], and classic hairpin loop of the radiculomedullary artery (open arrow). to ascend very high before it meets the ventral spinal axis. The classic hairpin anastomosis is seen at the thoracic and lumbar levels. The single ventral spinal axis (anterior spinal artery) is continuous from the basilar artery to the artery of the filum terminale. 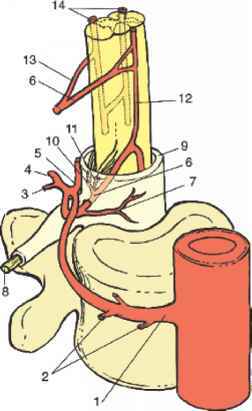 The artery of the filum terminale is the caudal extension of the anterior spinal artery. The anterior spinal artery may be focally discontinuous, especially at the thoracic level. The ventral spinal axis runs in the subpial space in the ventral sulcus of the spinal cord, dorsal to the veins. In the cervical region, there may be congenital lack of fusion of the embryolog-ical dual ventral spinal axes, resulting in a short unfused segment. The circulation beyond the level of the ventral spinal axis and the dor-solateral pial network (posterior spinal arteries) is conceptually divided into a centrifugal (from the center of the cord out) and a centripetal (from the pial surface toward the center of the cord) system. The centrifugal system is also known as the sulcocommisural system. The ventral spinal axis (anterior spinal artery) gives rise to 200 to 400 sulcocommissural arteries within the ventral sulcus of the spinal cord. These arteries penetrate the sulcus and enter the central gray matter, where they give off branches radiating outward toward the peripheral white matter. Each sulcocommissural artery usually supplies one half (right or left) of the cord. The sulcocommissural system will supply the majority of the gray matter and the ventral half of the cord. Before entering the cord substance, each sulcocommissural artery gives off cranial and caudal anastomotic branches to other sulcocommissural arteries. Craniocaudal anastomoses are also seen within the substance of the cord. Early in development, before the disproportional elongation of the spinal column in relation to the cord, the sulcal arteries have a completely horizontal course. With growth and the disproportionate elongation of the spinal column, they assume an ascending course. Yoss found that occlusion of the artery of the lumbar enlargement in primates caused severe damage to the ventrolateral two thirds of the cord, where the artery entered, and for a distance above and below.17 The territory of the cord supplied by the centrifugal system (from the ventral spinal axis) is comparatively as large as that supplied by the internal carotid artery relative to one cerebral hemisphere (Figure 1.12). The centripetal system is also known as the dorsolateral pial supply (from posterior spinal arteries). This network covers the dorsal and dorsolateral surface of the cord and has two dominant craniocaudal channels known as the posterior spinal arteries. At the craniocervical junction, supply to this system is directly from the transdural vertebral arteries, or from posterior inferior cerebellar arteries when their origin is below the dura. Below this level, arterial supply is from radiculop-ial arteries (Figure 1.13). Figure 1.12. The "centrifugal" arterial system: (1) the radicu-lomedullary artery, (2) the ventral spinal axis, and (3) the sulcocommissural arteries. Figure 1.13. The "centripetal" arterial system. (1) The radicu-lomedullary artery, (2) the ventral spinal axis, (3) the sulcocommissural artery, and (4) the coronary arteries from the dorsolateral spinal network (posterior spinal arteries). This system has a dorsal component and a lateral component (located between the dorsal and ventral nerve roots), which are interconnected. This network gives rise to radial/coronal arteries (vasa corona), which extend around the circumference of the cord and have anastomoses to the ventral spinal axis. 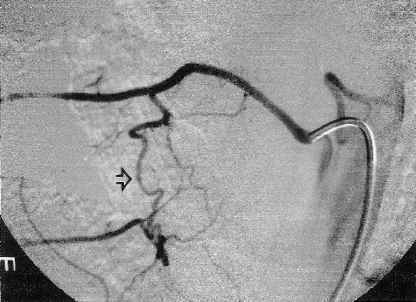 The radial/coronal arteries give off perforating branches to the cord all along their course. These short perforating branches extend axially, into the white matter and a portion of the gray matter of the dorsal horns. The perforating branches of the radial/coronal arteries have in-tramedullary anastomoses with branches of the sulcocommissural arteries dorsolaterally, ventrolaterally, and ventrally. There are also short, extramedullary longitudinal (craniocaudal) anastomoses between the radial/coronal arteries. These anastomoses are relatively small, however, and cannot provide adequate craniocaudal supply in the case of arterial occlusion. The dorsolateral pial network must therefore be regarded primarily as an axial system of arterial supply. The metameric/segmental artery is centered at the level of the intervertebral disc, the corresponding nerve, and the myelomere (cord). Therefore, the vertebral body is fed by two consecutive segmental arteries on each side (for a total of four). Each of the four will supply approximately 25% of the vertebral body. However, extensive anastomoses within the substance of the vertebrae often permit all or most of the vertebral body to be seen from one arterial injection. The somatic arteries anastomose on the posterior surface of the vertebral body, making a characteristic hexagon or diamond-shaped network on anterior-posterior angiography (Figures 1.14 and 1.15). 1. Lumbar and lower thoracic. Usually a hemivertebral blush is seen from one segmental arterial injection; this effect is evident only 25% of the time. 2. Upper thoracic. The right intercostal artery will opacify the right hemivertebra and the ventral half of the left hemivertebra. 3. Cervical and sacral. Symmetry is the rule, with opacification of the ip-silateral hemivertebra. We will approach the description of the venous anatomy of the spinal cord from the inside out. Venous drainage of the cord is divided into an intrinsic system (in proximity to the centrifugal arterial system but, naturally, with an opposite direction of flow) and the extrinsic system (in proximity to the centripetal arterial system). In general, the ventral dominance of the arterial system is not seen in the venous system. 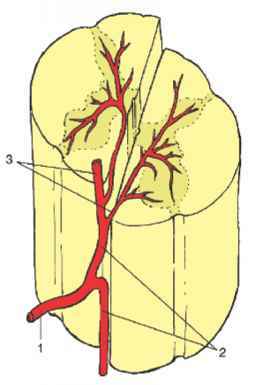 The venous drainage of the cord is relatively equally divided dorsally and ventrally. The intrinsic venous system comprises dorsal and ventral sulcal (sul-cocommissural) veins that collect the venous outflow from the central gray matter. Figure 1.14. Retrocorporeal hexagonal anastomosis of dorsal somatic branches to the vertebral body. (1) Vertebral body, (2) nerve root sleeve, (3) pretrans-verse longitudinal anastomosis, (4) segmental artery, (5) radicular artery, (6) disc, and dorsal somatic branch (open arrow). The extrinsic venous system can be thought of as containing the venous perforators draining into the radial/coronal veins, which in turn drain into the primary dorsal and ventral longitudinal collecting veins. These longitudinal collecting veins in turn drain into the radicular veins (analogous to the radiculomedullary and radiculopial veins), which eventually empty into the ventral epidural venous plexus. In addition to the main dorsal and ventral draining veins, there are short intersegmental lateral longitudinal veins linking adjacent radial veins. These lateral longitudinal channels are not large enough, however, to form a functional dominant craniocaudal channel like the dorsal and ventral systems. Flow in the thoracic longitudinal channels is bidirectional, with cervical drainage of its most cranial portion and lumbar drainage of its most caudal part. There can be multiple longitudinal venous channels, especially in the thoracic region, and ventrally (Table 1.3). The main ventral longitudinal venous channel is known as the anterior median vein (Figure 1.16). The radicular (radiculomedullary) veins drain into either spinal nerve venous channels in the neural foramina or a dural venous pool, both of which eventually empty into the ventral epidural venous plexus. Figure 1.15. 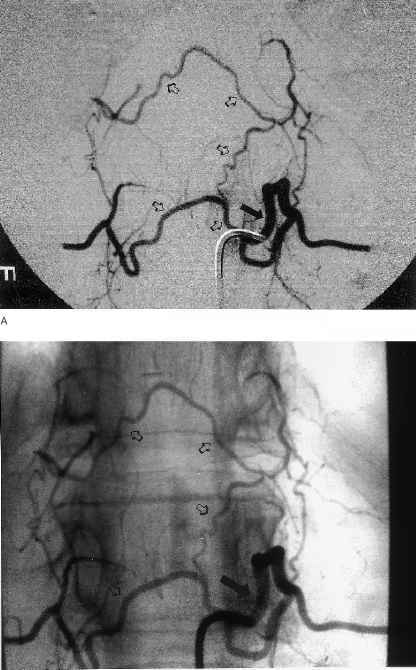 (A) Subtracted and (B) unsubtracted selective injection of the lumbar artery (solid arrow) showing hexagonal dorsal anastomosis of dorsal somatic arteries (open arrows) (supply to the vertebral body). Where is the dorsal ganglion root in the body? Is the radicular artery a selective artery? Is adamkiewicz artery of the lungs or spine? Can vertebral artery be outside of vertebral body?